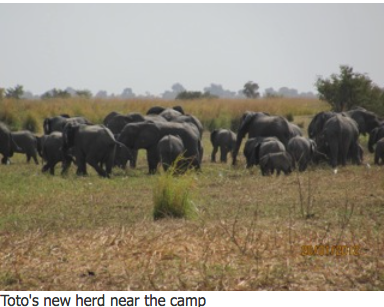 Today's guest post comes from Wildlife expert Laurel A. Neme, Ph.D., author of Animal Investigators: How the World's First Wildlife Forensics Lab is Solving Crimes and Saving Endangered Species and a regular contributor to Mongabay.com, where she broke the story on recent poaching of Chad's elephants. Learn more about Laurel at LaurelNeme.com. A baby elephant orphaned when poachers massacred dozens of elephants in southwestern Chad last week, has found a new home. The 3-week-old male, nicknamed “Toto”, was rescued by the wildlife organization SOS Elephants and then adopted by a neighboring herd. The baby elephant was found wandering the area after the June 24 attack after his mother had likely been killed. 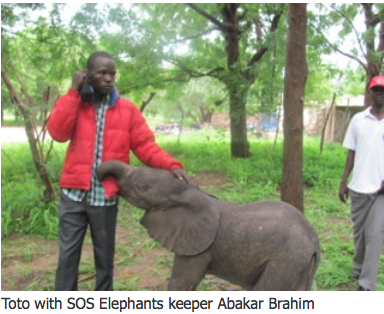 SOS Elephants staff carried Toto to their camp, examined the small pachyderm and fed him milk formula. The calf was uninjured but traumatized by the slaying and very weak. Over the next several days Toto roamed the bush under the watchful eye of two keepers, who slept with him and fed him milk formula every three hours. They let Toto wander because experience has shown baby elephants are less depressed when they maintain a normal life. A few days after the rescue, Toto ran to a nearby lake where a neighboring herd adopted him. Staying with this wild herd is best for Toto. Hand rearing baby elephants is costly and fraught with difficulty. Two of the orphaned infants rescued by SOS Elephants over the past two years died of illness. That is common for rescued orphans due to their weakened state. Even David Sheldrick Wildlife Trust’s elephant nursery in Kenya, which has been operating for decades, loses about 30 percent of its rescued elephants. Infant elephants cannot survive long without their mothers. They rely on their mothers’ milk for most of their nutrition until they are two-years-old, and are not fully weaned until five or six. SOS Elephants and the nearby village are monitoring Toto’s wellbeing and report that a foster mother is caring for him and feeding him milk. Yet Toto and his new family still face challenges. Less than two weeks after Toto’s rescue, another poaching incident occurred – this time with five elephants killed and two injured, including a mother followed by three calves. The exact numbers are unclear because searching is hampered by the continued presence of poachers, wet conditions that hinder movement by truck, and thick vegetation that limits aerial surveillance. While SOS Elephants confirms that neither Toto nor his substitute mother were hurt in this latest incident, another five to ten babies are alone in the bush. The good news is that SOS Elephants has already rescued one, and is searching for the others so they can be rescued too. To learn more, about these Elephants and the SOS Elephants of Chad - visit the SOS Elephants of Chad Facebook page or soselephants.org.